Chilli rating - med - 2. Real Thai. Versatile, aromatic paste for curries, marinades, soups & stir-fry's. Gluten free. No MSG. No artificial colours, flavourings or preservatives. 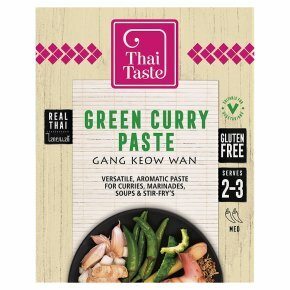 Suitable for vegetarians & vegans.This highly versatile, aromatic paste adds depth-of-flavour to any dish, is wonderful for marinating, or can be mixed with coconut milk for a fresh, tangy and aromatic Thai green curry. Ideal with any type of meat, fish or vegetable, this authentic paste is made with fresh ingredients.